From the makers of Britain’s Got Bhangra comes a new musical based on the 7th century romantic tale of Laila. Set against a Persian landscape with contemporary song and dance, it is a show which charts the tragic story of star-crossed lovers, 700 years before Romeo and Juliet. 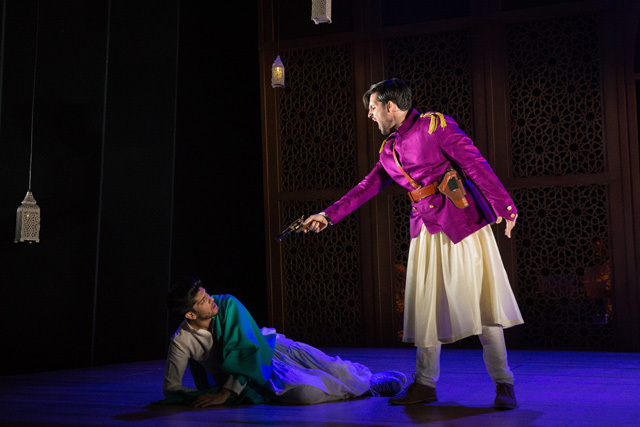 The play opens with a present-day scene in Yorkshire, as Laila struggles to find independence from her domineering father. Reaching between outstretched books, Laila touches on the classical tale of her namesake. Quickly the show transforms into a billowing whirlwind of fabrics and the scene is set to regale a story with some highly skilled shadow puppetry, easily one of the great highlights of the show. What follows is an eerily familiar romantic tragedy between Laila and her lover Qays; the pair are divided by their fathers who are engaged in war. Boy meets girl, girl loses boy, boy find girl again, girl and boy, predictably, die together. 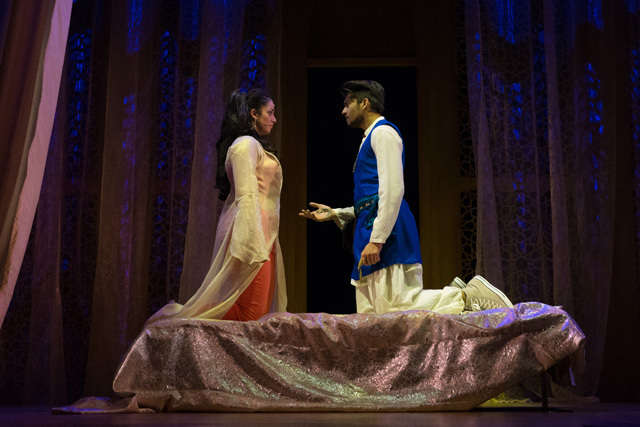 Whilst Laila may have been the inspiration for Shakespeare’s most famous romantic tale, the story somewhat precedes this new staging of a classic tale, offering little that is shocking or surprising in terms of plot. A bracing interlude is the music, which has stylistic tones of Lloyd-Webber & Rice, echoing Joseph and the Technicolor Dreamcoat in its cheery playfulness. Benjamin Holder’s score offers a traditional West End feel to the numbers, with an arrangement which is expanded with Indian percussion and samples. Locating the band behind some windowed scenery is also a smart atheistic touch. Reece Bahia as romantic lead Qays is charismatic and colourful with a vocal strength to match the best of the big West End leads, whilst Mona Goodwin delivers a stand-out performance as pitch perfect songbird Laila. As vocally adept as the cast are, however, the characters rarely grab a full interest and their motivations are thinly written. Thankfully Surrinder ‘Shin’ Singh Parwana as the overtly camp Prince delivers a deliciously cheeky performance, adding some much-needed pantomime to the show, even if the jokes are brutally on-the-nose. Laila The Musical is a bold and brave show which would work better in a smaller space. West Yorkshire Playhouse’s quarry theatre has a strange miniaturising effect on mid-scale shows, and perhaps the production would have been better suited to the intimacy of the Courtyard’s stage. As such, the gags don’t always fly high and the drama doesn’t reach out and make its intended impact. Apart from a charming shadow puppet sequence, this is a show which only reaches occasional peaks of greatness. Full of potential Eastern promise, Laila The Musical is a patchy mosaic of colourful ideas and catchy numbers, but rarely hits the heights that its legend inspires. Cast: Reece Bahia, Ravin J Ganatra, Mona Goodwin, Kush Khanna, Sami Lamine, Sheena Patel, Vedi Roy, Shin, Yinka Williams Director: Pravesh Khumar Writer: Pravesh Khumar Theatre: West Yorkshire Playhouse Duration: 150 minutes Dates: 4th May – 8th May 2016.